Along with the catering services, we also provide services like tenting, DJ, Florists and decoration services to make sure your wedding is hassle-free. While we do individual catering, we have also worked with various wedding planners and event management companies. As a result of which, we certainly provided more than just catering. Above all, our prices are competitive as per the industry standards. So if you’re ready, let’s plan your wedding catering now! 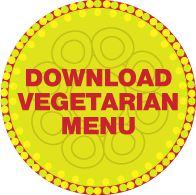 Download the menu of your choice and reach out to us for costs.